Adjustable supply center to center spread: 4 3/4 to 7 in. 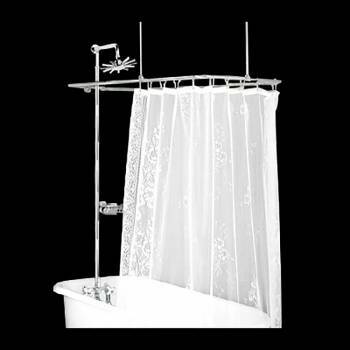 Adjustable Shower Riser Height: 33 1/2 to 61 in. Deck-Mount Shower Enclosure: Complete your vintage bathroom. The faucet features classic porcelain cross handles and a diverter lever. Brass construction and chrome plating mean that this faucet will be around for long time. A 38 in. ceiling brace and a 16 in wall brace are included for sturdiness. Riser shower adjusts in length from 33 1/2 to 61 inches. Luxurious Rainfall showerhead also included.